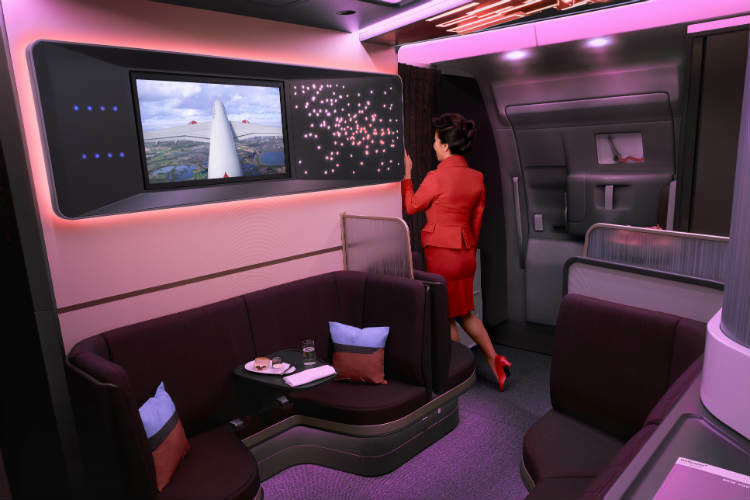 Virgin Atlantic has revealed a range of redesigned cabins for the airline’s new fleet of Airbus A350 aircraft, including the introduction of "The Loft" for Upper Class Passengers. The airline, which is due to get its first three A350s this summer, said the new cabins would include: larger panoramic windows, extra storage for passengers, USB charging points, high-speed Wi-Fi and an enhanced entertainment system. Virgin has ordered 12 A350-1000 aircraft, which will feature 44 seats in Upper Class, 56 in Premium economy and 235 in economy. Virgin Atlantic's first Airbus A350 will begin flying between London Heathrow and New York JFK in August, with all twelve A350s due to delivered by 2021. All of the new 44 Upper Class suites on the A350s will face towards the window, an improvement on the current aisle facing affair, with the suites featuring more privacy, space and storage, alongside adjustable mood lighting and an 18.5 inch screen. The cabin will feature a 1-2-1 configuration with the suites offering a 44 inch seat pitch as well as being able to recline into a fully-flat bed. Each suite features a cocktail table, shelving and a tray to store personal items. The suites will also have higher walls compared to existing Upper Class cabins and privacy screens. However, it does not come with sliding doors like British Airways new Business Class, which was announced a month earlier. Virgin Atlantic A350-1000 "The Loft"
This new social space for Upper Class passengers will be the largest of its kind on any of Virgin’s aircraft, with space for up to eight customers. Travellers will be able to have a drink or dine with friends in The Loft, which will also feature a 32 inch touchscreen monitor and eight Bluetooth audio jacks to allow passengers to view content together. The introduction of seat belts in The Loft will mean that passengers will no longer have to head back to their seats if turbulence strikes. The Loft has been designed by Virgin and London-based Factory Design and manufactured by Aim Altitude in Bournemouth. 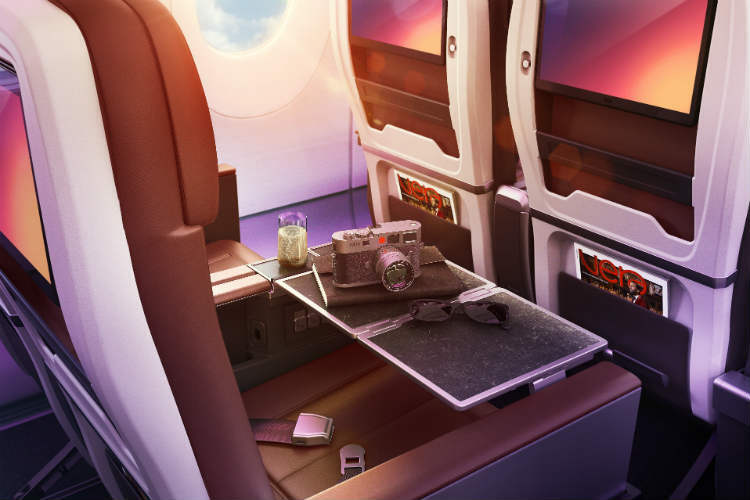 The 56 Premium seats will feature increased storage, USB charging ports and a 13 inch screen (the largest size ever for Virgin’s Premium cabin) and they will be arranged in 2-4-2 configuration. The leather seats also include: a cocktail tray and meal table, an adjustable headrest, a seven-inch recline and an “intuitive” entertainment system which is controllable through a passenger’s personal electronic devices. Virgin’s new economy cabin, featuring 235 seats, will be arranged in a 3-3-3 configuration. 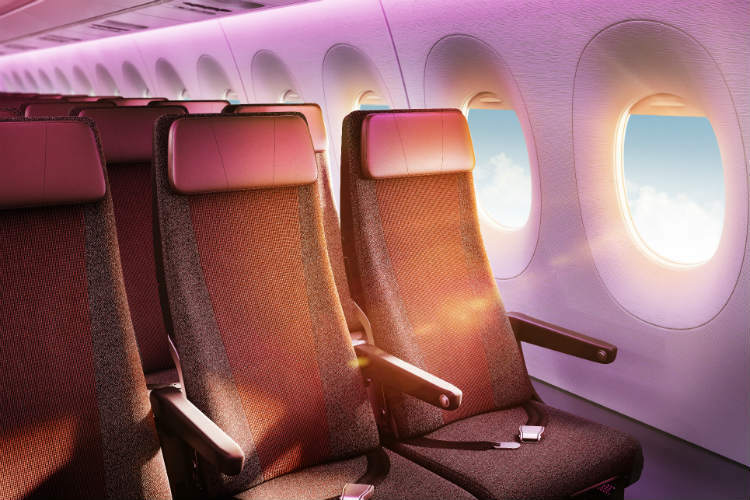 The seats will have 11.5 inch seat back screens, equipped with the airline’s new entertainment system, which can be operated by personal devices; the seats will have a pitch of 31 inch's. Sam, how do the Premium seats compare to the 787 ones? Hi Andy I haven’t seen the real products apart from these press release rendered images. Thanks for your comment. I will wait until flying the real product to compare it.